The Spectra Precision RD20 wireless in-cab remote display can quickly and easily be positioned in the cab, without cables, to improve visibility. Additionally, most receiver functions can now be controlled in the cab with the remote. The RD20 remote display links directly with the new family of wireless receivers: LR30W, LR50W and LR60W. 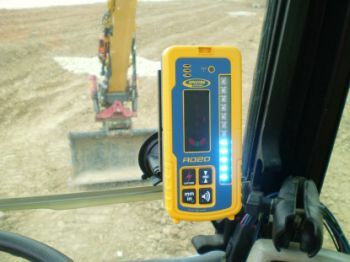 The wireless display receivers have all the features and benefits of the conventional receivers and continue to use your existing laser, install in minutes, require no wiring or welding and instantly increase productivity up to 30% on your skid-steer loader, backhoe, excavator, bulldozer and trenching machines.